What was that dreadful smell at just after seven o'clock on Saturday night? Why, it was the nation's under-12s reacting as under-12s will to the opening scene of Doctor Who (BBC1), which was almost enough to make me react with them. A dead old lady sat bolt upright on a mortuary slab, her eyes went all funny, she throttled her grieving grandson then set off screaming through the streets of Cardiff: All this was before the diddly-bong of the theme music, which isn't bad going. Mark "League of Gentlemen" Gatiss's first stab at writing for the Doctor was a rich stew of genuine horror and gleeful cliché, with a big dollop of Eng Lit chucked in for good measure. Dumbing down? Hah! We discussed the finer points of Charles Dickens's oeuvre and Einstein's theory of relativity while chasing around in horse and cab. Billie Piper looked more than usually lovely in a Victorian off-the-shoulder number (for the dads) while Zombie Gran was there to terrorise the kiddies. We even got Simon Callow doing his Dickens turn ("What the Shakespeare is going on?"). Doctor, you're spoiling us. With all this on the plus side, it seems churlish to nit-pick, but that's what I'm paid for - so, am I the only one to find Christopher Eccleston's grinning a bit tiresome? It was all well and good to establish him as a matey, northern Doctor in the first episode, but frankly I'm hoping for a bit of depth at this point. He does look nice in a leather coat, though, which 99% of the sci-fi loving population does not. APA 6th ed. : Smith, Rupert (2005-04-11). The traveller in time. The Guardian p. 22. MLA 7th ed. : Smith, Rupert. "The traveller in time." The Guardian [add city] 2005-04-11, 22. Print. Turabian: Smith, Rupert. "The traveller in time." 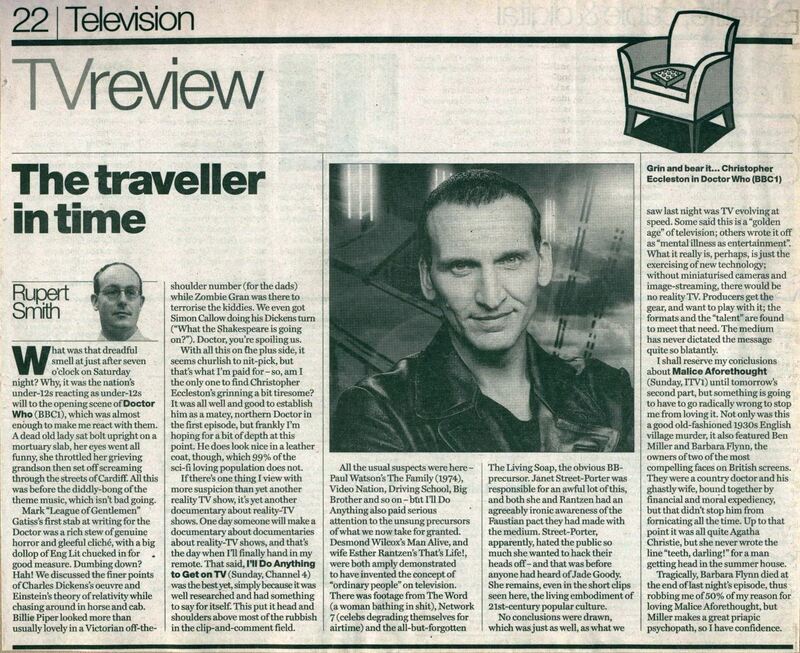 The Guardian, 2005-04-11, section, 22 edition. This page was last modified on 26 August 2016, at 22:39.